Who is All Saints Estate? The 2013 Family Cellar Marsanne has lovely notes of white peach, citrus and pear with oakey notes. Delicious! It was paired with this platter! This wine can be enjoyed now or cellared for about 5 years. Marsanne is a white wine grape, most commonly found in Northern Rhône, France. It is also found in Switzerland, New Zealand, Australia of course and the USA. The 2013 Family Cellar Shiraz is a full bodied Shiraz with notes of plum and red berry fruits with hints of pepper and spice. It would pair well with a nice salmon dish as Once Upon A Wine did with Hello Fresh along with pesto potatoes! The 2012 Family Cellar Durif has lovely plum and red berry flavours with hints of spice. Definitely worth checking out. It is very food friendly and can be enjoyed with a slow cooked lamb dish. This wine was aged in French and American oak. 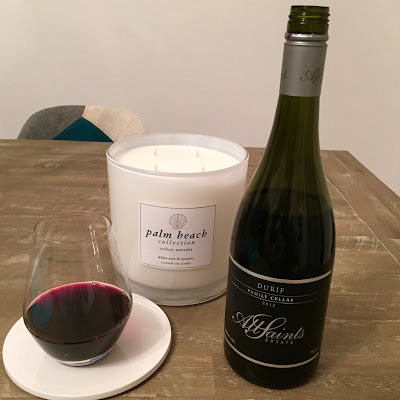 In case you haven’t heard of Durif, it is a red wine grape which originates from Montpellier in France but is also primarily grown in Australia (and is popular in the Rutherglen area), California and Israel. It is also sometimes known in some places as ‘Petite Syrah’. Want to contact All Saints Estate? Want to follow more of my wine adventures?